The Vegas movie for everyone who's grown tired of the ultra cool Ocean's Eleven crew breaking every bank on the Strip. The biggest surprises were the coherent story that held the Vegas gags together and how likable and relatable the four leads were. Bradley Cooper's reaction shots to everything Zach Galifianakis said and did were especially funny. 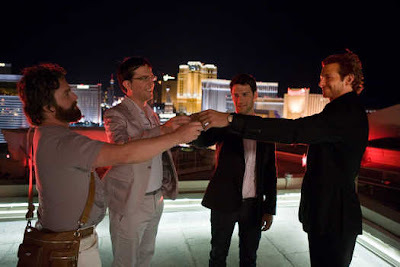 The Hangover is a hilarious all-inclusive checklist of everything a gang of buddies would and wouldn't want to happen during a Vegas bachelor party: Marry a stripper, wrangle a tiger (no). Hang out with Mike Tyson (yes). And yet The Hangover surprises with a very nice message about friendship and loyalty between the four leads. The picture slideshow over the credits filling in the blanks of what actually happened that night were worth the price of admission on their own.